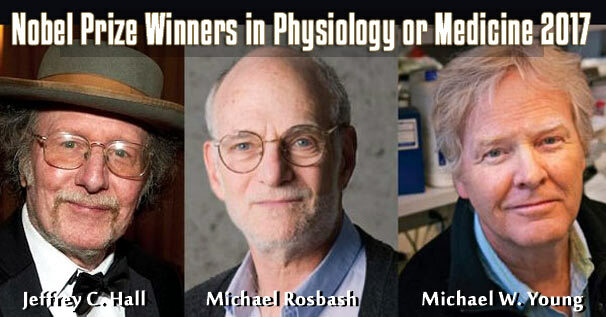 The 2017 Nobel Prize in Physiology or Medicine has been awarded to Jeffrey C. Hall, Michael Rosbash and Michael W. Young for their discoveries of molecular mechanisms controlling the circadian rhythm. The announcement marked the start of this year’s Nobel season. It is the 108th time the prize has been awarded. “Jeffrey C. Hall, Michael Rosbash and Michael W. Young were able to peek inside our biological clock and elucidate its inner workings. Their discoveries explain how plants, animals and humans adapt their biological rhythm so that it is synchronized with the Earth’s revolutions,” the Nobel Foundation said. The medicine prize will be followed by the physics prize announcement on Tuesday. The honour could also go to the discovery of exoplanets by Swiss astrophysicians Michel Mayor and Didier Queloz. The chemistry prize committee will announce a winner in its field on Wednesday. A recurring favourite for the prize is John Goodenough, a 95-year old electrochemist whose pioneering work led to the invention of rechargeable lithium-ion battery present in cell phones, computers and electric cars, reported AFP. The Nobel peace prize will be announced in Oslo and on Friday. While the economics prize will be announced on October 9, the winner of this year’s Nobel Prize in literature will be announced on Thursday. This year, each Nobel comes with a nine million kronor ($1.1-million, 940,500-euro) prize sum, to be shared if several laureates are honoured in the same discipline.